It had been a short while since Azusa had triumphed over Kaji in the arena. When all had been said and done and every spectator had gone their separate ways Riyota was still left with a single peculiarity. A black rose, gifted to him by a fellow spectator of presumably some esteem. The mystery woman had not introduced herself but seemed to take a vested interest in Riyota, or more accurately, what Riyota knew about Azusa. The woman had vacated abruptly after some general inappropriateness had transpired on the boundary of the arena that left many people uncomfortable. Before she left though, she presented Riyota with the black rose he now held in his hand, and a promise that she could give him the secret to protecting Azusa. The promise of this kind of information was enough to make the shinobi forgo caution to hear what she had to say. So here he was, wandering through the unfamiliar streets of Kurosawa honing in on a chakra signature that matched the one flowing throughout the flower that he now held. To the casual observer it's likely he looked like a lost and hopeless romantic, desperately trying to find his way to that one special lady. In reality Riyota's thoughts were pure, he simply wanted to hear her out. Though who could say what her plans would entail with her mind-addling perfume. After a long while his search came to a head outside a large, grand looking building. A home or a hotel? The young man couldn't quite discern. What was obvious was that it was clearly a building intended to house the elite of the Ninja world. Certainly a place Riyota could not hope to ever afford. Even with all he had seen, he couldn't resist letting out a small "Woah..."
Swallowing, he tentatively made his way inside, unsure how he was supposed to explain whom he was searching for considering he didn't know her name. There was the very real possibility he could get kicked out of this building for suspicious behaviour. Regardless, he approached the nearest person who seemed like they worked in the building and cleared his throat. "Um...hello, I'm looking for a woman with very pale skin and dark...raven-like hair?" It was a pretty piss poor description, even he knew it. In an attempt to salvage his case he held the rose out in front of him. "I-I believe she's partial to these?" He added, hoping that would perhaps help his point along. Only time would tell if he met with the woman he was looking for or if he was thrown out to the dirt. The building which the black rose had drawn Riyota to was indeed a hotel but other words such as "palace" might have come to mind for the more imaginatively inclined. Extremely well lit on the inside, every inch of the accommodating building dripped with finery and decadence. This was a place that most men and women could struggle and toil their entire lives and never possess even a tenth of the amount of wealth that would be required to secure even a night's stay at an establishment such as this. Still, even with the splendor of the lobby it might seem somewhat odd that the building did not seem like a terribly busy establishment. If Riyota was observant as he strode into the proverbial lion's den he might mark the presence of a number of men dressed in the same fashion as those that had flanked Kitai in the stands during their brief meeting. Just as before their faces were impossible to get a good look at from the way the blood red scarves wrapped about their features and the edge of their pointed metal skull caps hung just low enough to prevent any identifying features from becoming visible. One of the strangely uniformed soldiers stood at each side of the doors on the inside and at least one of them lurked at the threshold of each door within the building but none of them made any moves to stop or halt Riyota as he entered. In fact, they seemed to not notice him at all as they failed to even register that he had walked past them though the feeling of many eyes being upon him could easily be felt by the young man as he entered into the lobby and approached the desk where a taller gentleman in a clean-cut suit stood occupied with tidying up behind the lip of the desk. He was older in years, his well kept and trimmed facial hair and professionally groomed hair both grayed but still dignified in appearance and had somewhat of a sharper look to his expression but as Riyota approached he looked up and his expression softened as Riyota produced the black rose. "Of course you are." Replied the host in response to Riyota stating that he was looking for a woman with dark hair and pale skin. Despite Riyota's extremely vague description, it seemed as though the host knew exactly who he was talking about. 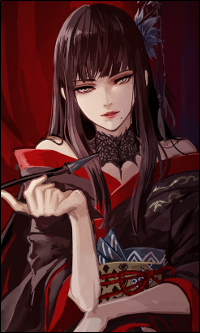 "The mistress has been expecting you. This way my young friend." The host came quickly out from behind the desk and gestured that Riyota should follow behind him through a passageway that was off the lobby but still on the bottom floor. There was no door to be opened to the hall, though the mouth of the hallway still sported one of the pointy-hatted guards like each door and hall did elsewhere in the grand lobby and if Riyota chose to follow the host he would see that the passage extended down quite a ways into a rather long hall-way that had a plethora of doors that split off from it-- again, each equipped with their own silent and completely still guardian. Through passion I gain strength. Through strength I gain power. Through power I gain victory. The sharply dressed gentleman seemed friendly enough and, at the very least, was willing to accommodate Riyota's request to see the woman in question. The man stood and gestured for the shinobi to follow him to the 'Mistress'. As they began walking Riyota began to notice the lack of foot traffic in the area. The entire place was almost devoid of guests and patrons and it seemed the rooms were mainly populated with guards. The guards all wore the same uniform as the ones that had been accompanying the woman in the arena. There was definitely a distinctness to their uniform that made it easy to recognise. Riyota wondered why her bodyguards were the same as the hotel guards, did the hotel dispatch a security detail specifically for their patron or did she have enough influence within the hotel to have her own private security installed within it? There were many questions that would probably remain unanswered. The guards themselves barely paid any attention to Riyota, he barely even caught a side eye or a glance, he was almost invisible to all of them. It was curious indeed, Riyota rotated the wrist on his prosthetic in a bit of nervous tic. He was ready to use the blades concealed in both his arms if this had turned out to be a heinous trap. He disguised his nervousness for now though. He had come here in good faith because the dark haired woman had promised him information, he desperately hoped he wasn't about to be blindsided. The hallway they were traversing down seemed unbelievably long, door after door lined along its span with many other corridors splitting off of it. The building was grand to be sure and Riyota felt lucky to just be allowed to stand in it, knowing that in any other circumstance he wouldn't have had any sort of chance of affording the establishment. "This place is...really something." He commented, attempting idle conversation with the man just in case their travel time was longer than expected. "Your...mistress, I never quite caught her name. Would you mind? I'd hate to seem rude." He casually asked the host if he could inform him of the name of the person Riyota was about to meet with. The shinobi considered asking more questions but before he was able the host gestured to a door far along the hallway, possibly even at its end, and informed him that they had arrived. Tentatively, Riyota gently knocked on the door. "The mistress will introduce herself when she chooses to." Was all the grayed older gentleman was willing to say on the topic of Kitai's name. There was no fear in his voice so it didn't seem as though he were afraid of telling Riyota her name, only that he was unwilling to do so. Perhaps she wished to save the right of introduction for herself? It was hard to say. The older man's face was an inscrutable mask as the two walked, betraying nothing of his thoughts on escorting a young man down the hall of a seemingly otherwise deserted hotel which was stocked to the brim with what seemed like a legion of similarly dressed guards. Eventually the two came to a door and with a smile and gesture the host indicated that Riyota should knock on the door and he did but not without a moment's hesitation. Nodding that his job was done, the host turned away from Riyota and the door with intention to return to the front desk to mind the otherwise completely empty lobby and the silent guardians that stood watch over it. After a few moments the sound of soft scuffling would come from behind the door-- the sound of a deadbolt being undone --and the door would creak open to reveal a young man with an appearance that implied his age was not that much greater than Riyota's. He wore an expensive-looking suit and wore his bright green hair short with a wide grin on his face as he greeted the Sunagakurian shinobi at the door. "He's here, mistress." Called the grinning man over his shoulder, looking into the room for a moment before cocking his head slightly to the side and then stepping out of the way with a bow. "Please, come on in." The room itself was not tremendous in size but it was certainly spacious enough for the interior of the type of hotel that it was situated within. If Riyota proceeded into the room he would quickly discover that it was less of a room meant for lodging and more of a meeting room of sorts. 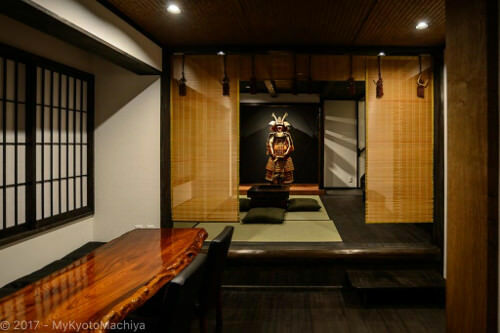 There was a bar with a number of stools perfectly arranged beneath it and just past that a raised section of tatami mats with a chabudai table and a number of sitting pillows near it and at the back of the room lounged the Hungry Dragon herself-- Kurohane Kitai. With a veil of smoke swirling around her, Kitai had her eyes squarely placed upon the door and fixed them directly on Riyota as soon as the as-of-yet unintroduced young man with green hair moved aside and ceased blocking her line of sight. With a demure wave, she smiled and beckoned Riyota to come further into the room and join her at the back of it where she sat at the small table. "I'm so glad you could make it." She said, her voice carrying across the room with ease despite the fact that she was not yelling by any means. "Please, join us." "Right..." Riyota responded awkwardly to the man's refusal to inform him of the mistresses' name. It seemed they loved to stand on ceremony within her inner circle and Riyota had no real issue with that, he only worried about seeming rude if he had actually only forgotten her name. The Jonin did not have much time to dwell on the issue before he was instructed to knock on the door that the host had stopped beside. Pausing for a moment he tentatively but loudly knocked three times on the large door. The door itself would be opened to reveal a green-haired man of a similar age to the shinobi himself. Without much of a wait he called to an unseen figure announcing Riyota's arrival. Once the man stepped aside Riyota could see the familiar image of the woman he had met at the tournament. Looking around briefly he stepped just inside the doorway. His rather scruffy appearance contrasting heavily with the posh room he found himself in and making him feel quite embarrassed that he was not of the social standing that these walls would be used to. The woman greeted him and beckoned him toward her. Nervously he shuffled forwards, not taking his typical long strides and instead rather meekly approaching her. He sat down at the opposite side of the table to her, facing her directly and focusing on her alluring eyes, not yet saying a word. He made sure to not let his eye line stray to any of her other attractive features, as the last thing he wanted to do was be rude. After a few moments he drew the black rose from the inside of his jacket and attempted to hand it to her. Prompting her to make the first move in the conversation. Kitai's smile deepened as she looked on at Riyota's discomfort. It made sense why he was uncomfortable-- he had been called into the den of a person who was clearly one of the wealthy elite of the city without really much knowledge about her other than she had a bewitching presence and had showed some level of interest in him... and in Aikayume Azusa. It was still unclear up to that point whether the entire building simply belonged to her or if she had for some reason rented out the majority of it but the former seemed like it was the more likely scenario given that the uniformed guards which had followed behind her in a pack at the stadium were stationed at every threshold in the building. Still, that didn't explain the lack of other guests. A hotel like this should have theoretically been brimming with guests at this time but Riyota had not yet seen a single soul who was not obviously on Kitai's payroll to some level. As Riyota passed him, the man in the fedora and cleanly cut suit with green hair eyed him with a grin of his own though he made no effort to hide the mischief in his expression. He leaned back against the bar without saying a word to Riyota and simply watched as the young Sunan crossed the room and sat before presenting the black rose that Kitai had given to him at the end of their first meeting. Taking a short pull from her pipe as Riyota sat and produced the rose, Kitai blew a tight blossom of smoke from her lips before reaching forward and gracefully plucking the rose from his fingers, bringing it in close to her face and sniffing it. "I was beginning to fear that you had forgotten about me." She pouted over the rose, flicking her eyes up towards Riyota. "But I suppose you can be forgiven your priorities. After all, your pretty little paramour did quite well for herself in the tournament didn't she? It would hardly be fair of me to begrudge your celebration." She gently placed the rose down on the table before her next to a small cup of tea which she then roped her fingers around the small handle belonging to the tea cup and brought it up to her mouth for a short sip. "If you are thirsty or hungry, I can have Greed bring you something." Riyota cast a glare to the green-suited man. Making it blatantly clear that he did not enjoy the face he was pulling. Returning his attention to Kitai only when she plucked the black rose from his hands. His mismatched eyes looked her over once more as she began to speak. The shinobi listened in silence, only nodding slowly at her statement. "My Lady is indeed a fearsome combatant. I had no doubts of her victory. There were also other circumstances that prevented this meeting, but I'm here now." He affirmed to her that it hadn't been from lack of interest that this meeting had been delayed. Riyota began to take in his surroundings, eyeing every object carefully as Kitai paused to drink. It was a tic of his creeping anxiety that all wasn't quite well here. His host had given him no reason to feel uneasy and yet he couldn't shake the feeling that something was very off. His train of thought was interrupted by an offer for refreshments. The young man glanced back at the green suited grinner, now revealed to be Greed, and smirked slightly. "Are you sure you'd want someone named Greed in charge of food and drink? I'd be checking your stocks if I were you." A small and fairly pathetic joke but he wanted to gauge the reaction, whether it would be offence and anger or a polite laugh. That would at least tell him something. "And thank you, but I'm alright at the moment." He shook his head and politely declined the offer. Not trusting Greed to not tamper with his food. "If I may be so bold as to rush us slightly. Why is it you called me here?" He asked, growing more and more eager to get down to business.